The Interview may have benefited in investing more energy in compiling a stronger supporting cast -- this would have at least allowed the humour to potentially branch out and find new gags that unfortunately weren't present. Franco and Rogen are amiable enough in the lead roles, with good chemistry that has developed from previous collaborations. The Interview is a forgettable comedy with an unforgettable advertising campaign, yet should still be seen for the amount of risks the filmmakers took to get it made at all. 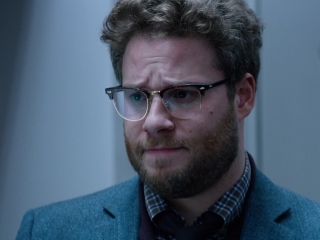 The Interview may have put studios off making movies about North Korea, but hopefully it will be an inspiration to comedy writers to make the weirdest, most high-concept movies imaginable. It's ground zero for our current culture wars - not because it's a good movie, but because it is bad in an unexpectedly revealing way. I would have willingly taken several strips of ricin myself to be spared a single extra minute of the terrible, gurning, prancing, toweringly irritating piece of idiot ham that is Franco. The Interview in a nutshell: Half-baked and ultimately forgettable. Its important to note that the movie is not so much a political satire as much as it is the typical Rogen-Franco-pot-filled-film we've come to expect. The Interview is gross and racist, and most of the time, it's not even funny. Hysterical, silly, big dumb fun that makes for a great night out with your friends. Even the film's most ardent champions would likely concede that The Interview is a spectacularly weird film to end up at the center of a free speech brouhaha. It's funny and strange, with an admirably gonzo sensibility, and it approaches the job of mocking Kim with the appropriate degree of joy-buzzer delight. [Franco's] free-spirited screen presence gives the film the kind of anarchic momentum it requires, mirroring its totally-serious-but-not-at-all-serious bent. The Interview, conversely, is little more than a sloppy air kiss blown lazily under the banner of free speech. The suffocating level of redundancy on display kneecaps any legitimate chance the film had at embracing social satire. I liked it for what it is. There has never been as silly and inconsequential a film that prompted as huge a political fuss as this. Whether it lives up to its reputation as a banner for the rights of "artists" to fictionally assassinate a living head of state might be debatable. Whether it is truly funny, outrageous or touching is obvious: It is not.